Just wanting to thank Monique, one of my lovely customers, for sending in a photo of her beautiful nursery. Looks like my owl (who has been named 'Flaps' by Monique's older son) is in good company. 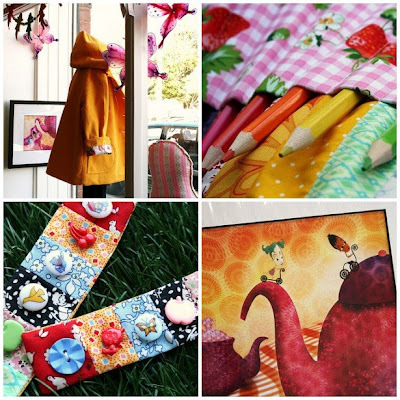 I spy some Aunty Cookie, Kristen Doran, Kirin notebook by Lara Cameron, all local fabric designing gals and fellow bloggers. Who else can you see? Fiona has delivered about a third of my order, more cool styles to come...just gotta be patient. Limited sizes available so give me a ring if you want anything put aside, and remember I'm happy to post. Some really wonderful things have been landing on my doorstep recently, here's a sneak peek... 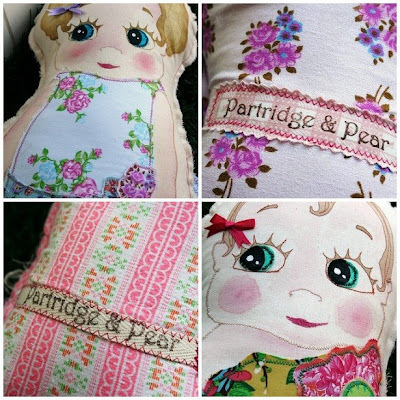 These wonderful 'Lucy dolls' by Partridge & Pear are handmade using a combination of techniques including textile painting embroidery and applique. The fabrics are gorgeous and some are from the designers collection of vintage textiles. 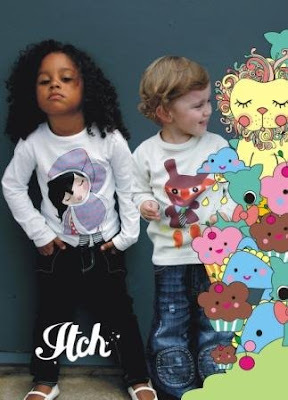 Stay tuned for an interview with the talent behind Partridge & Pear...coming soon! Jo (Violet & Rose) dropped in some of her lovely accessories on Friday. I haven't photographed tote bags or belts but you can check them out on her blog. The button bracelets will be for sale on Poppet in the Post this week. And last but not least, a whimsical collection of limited edition digital prints by illustrator and animator Wendy Tyrer aka Dr Feryl, a lovely local gal who has so graciously allowed me to display her beautiful work and maybe sell some of it too! I can hear the F1 cars from the shop...in Caulfield (5.5kms away)!!! Talk about LOUD, I hope the spectators at the track are wearing hearing protection. Got bitten by the crafty bug on the weekend after one of my customers requested a huggable owl, here is my 1st attempt. His friend has already been sold. I also made some of the squishy baby blocks with rattles inside. They are fun to stitch together at the shop when its a bit quiet. I've made a tutorial which I'll post in the next few days when I get a chance. I probably could have posted it today but have wasted most of my morning (and afternoon) watching funny youtube videos and searching for stuff that i really don't need on eBay! I promise I won't wait till the last minute to fill the car up! Totally stressed last night driving home, caught in major long weekend traffic gridlock just out of the city with not a bowser in sight. Was so slow that I had a lovely conversation with a lady in another car for about 20min. Had to get creative. Dumped the car on St.Kilda rd, jumped on a tram into town and met up with Mr. Cinti (yes 1st mention I know. He won't be impressed). Sort of worked out well in the end (apart from the embarrassment of it all), he felt sorry for me and took me out to a lovely totally delish dinner at the Press Club on Russell st. Talk about swish! Yummy, Yummy Greek food like I've never had before, fabulous service and too exxy to go on a regular basis...boo hoo. We'll have to eat 2 min noodles for the rest of the week. Caught the tram back to the car and filled up on the way home. Monday- Finally got around to buying a new pair of shoes on my morning off. Almost identical to the previous pair that i really loved but wore a hole through. Can't beat a pair of flats when you're on your feet all day. Tuesday - Picked up some new prints by Tamara from the printers Wednesday- unpacked (and tried to find coat hangers for) a heap of new winter stock. Friday - Visit from my new accountant Craig. Very friendly which is helping me get over my 'fear' of accountants, although i haven't seen his bill yet! I'm sure he's worth every penny. Was exhausted by Tuesday and now just 'running on fumes' which reminds me i must fill up the car because it's literally running on fumes! ... with some Owlets that arrived in the shop this weekend. Does any one have any ideas on how to best display beanies? This was the best i could do today.